Guardian critic Maddie Costa was in residence at the Battersea Arts Centre while I was over there doing A Moment in Yarn for the Scratch nights, and she asked each artist to participate in a project called Dialogue. As part of that I created a Moment in Yarn for her based on one of her early memories. Sayraphim Lothian was beginning to forget things about her grandmother when a friend gave her an idea. 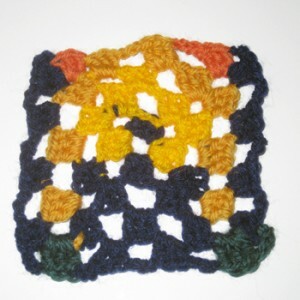 Turn the memories into granny squares. Crochet a five-inch-square image of each memory, create a switch for the electric currents in your brain. So she did. She took some wool, and crocheted a tiny rendition of a game of Scrabble: cream for the wooden tiles, crimson for the board’s leather backing (her granny had the posh version of Scrabble). Later, she began crocheting other memories: her wedding day, for instance, with two gold bands for the rings. And later still, she turned the idea into a Loveliness Project, inviting people to tell her their memories, which she would crochet while they watched and hand to them at the end of the “performance”. This is my memory. I’m young. It’s a summer evening and the sun is thinking about setting. My dad has taken me and my brother to the playground near our third-floor flat and it’s time to go home. Of course we don’t want to go. He walks in between us, holding our hands, one on each side. I look behind me and the sun seems huge, a fiery disc of gold that burns into my eyes. The trees and buildings appear as silhouettes, nothing more.